She’s the LAPD’s best corpse-kicker. Dayna Chrissie, LAPD’s leading Crime Scene Analyst, relishes finding the one clue that can solve a crime. When she finds a golden medallion on a body that’s been dumped at a downtown construction site, she doesn’t think it’s all that unusual. Until that medallion’s enchantment brings her to the magical world of Andeluvia. She must find a killer in time to stop a war. Dayna discovers that she’s been summoned to solve the murder of the realm’s king before war breaks out between Andeluvia and the Centaur Realm. But no one wants peace when war offers chances for riches and glory. So Dayna ends up with a team of cast-offs: a centaur wizard with father issues, a brash griffin warrior, and the world’s unluckiest magical deer. And the trail leads where she least expects it…back home! When the trail of evidence brings Dayna and her new friends back from Andeluvia to Los Angeles, she must use all of her forensic knowledge in order to solve the case. The price of failure? A war that will kill millions and devastate Andeluvia. 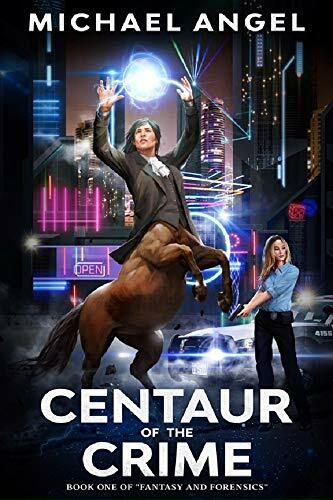 Click here to pick up your free copy of Centaur of the Crime in the Amazon Kindle store. Michael Angel’s fictional worlds range from the magic-filled realm of Andeluvia to the gritty post-apocalyptic version of heartland America. His eBooks, audio books, and paperbacks populate shelves in 12 different languages. However, despite keeping a keen eye out for griffins, centaurs, or galactic marshals, none have yet put in an appearance on Hollywood Boulevard. You can visit Michael’s Amazon author page if you click here.